Connection to a PC occurs via the integrated USB 3.0 cable, a power supply is not required for operation. Thanks to the enclosed CD with driver and manual, the PC can simply expand with the network function of the hubs, connection to the network occurs via RJ45. It’s supported with USB 3.0 SuperSpeed data transfer rates up to a max. 5 Gbit/s. 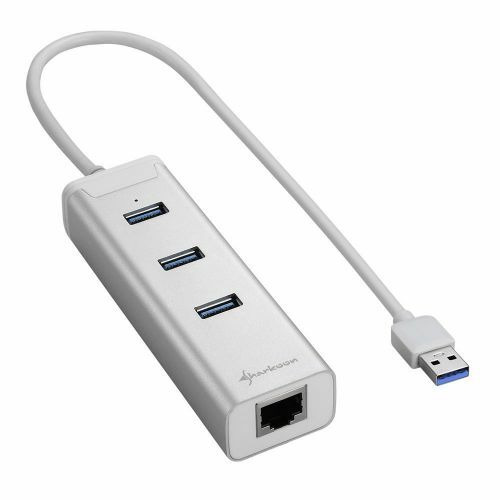 Therefore, the external hub is well prepared for the quick and easy connection of external media and is of course backwards compatible with USB 2.0 and USB 1.1. The integrated network card provides Gigabit Ethernet with 10/100/1000 Mbit/s and is ideal for current data transfer rates of modern networks and private environments. Thanks to its sleek and elegant design, the 3-Port USB 3.0 Aluminium Hub + RJ45 leaves a positive visual impression and is therefore an ideal complement for every PC, especially for high-quality notebooks and Ultrabooks. Έχετε κάποια ερώτηση σχετικά με το προιόν Sharkoon 3-Port USB 3.0 Aluminium Hub + RJ45 Ethernet Adapter Silver?